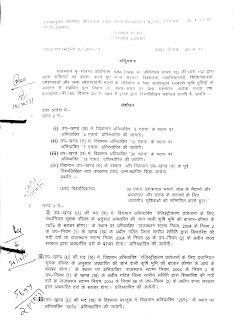 THIS WEBSITE IS MAINTAIN BY AN EMPLOYEE OF RAJASTHAN REVENUE DEPARTMENT AS A HOBBY AND THIS IS MY TRY TO HELP FOR OTHER EMPLOYEE OF REVENUE DEPARTMENT BY PROVIDE HIM REVENUE DEPARTMENT ACTS RULES AND CIRCULARS. 1. 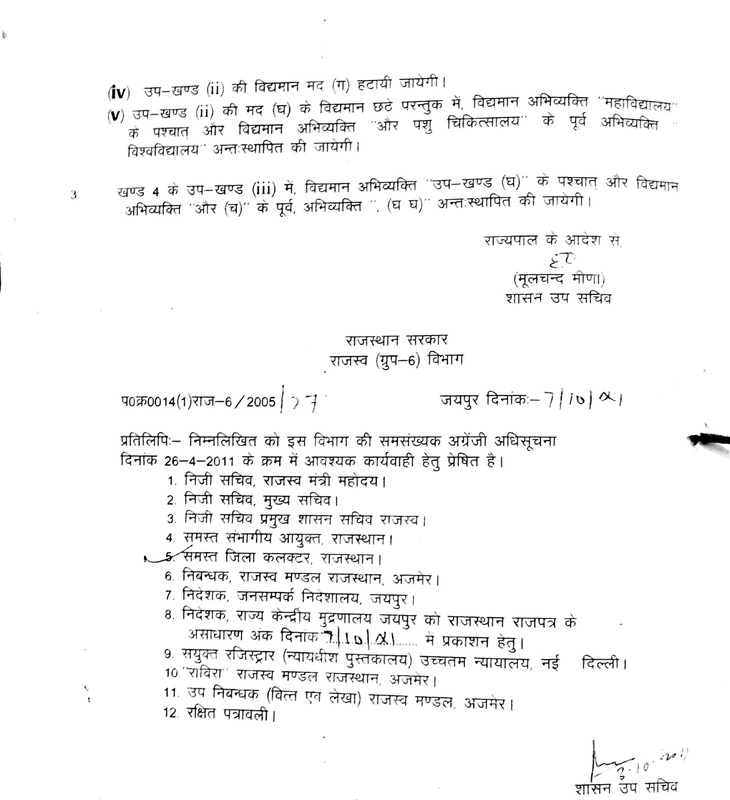 Today I provide Notification no F14 (1) Raj-6/2005/7 Jaipur date 26.04.2011 by Rajasthan Government Revenue Gr-6 Department. 2. This Notification is in Hindi language. 3. 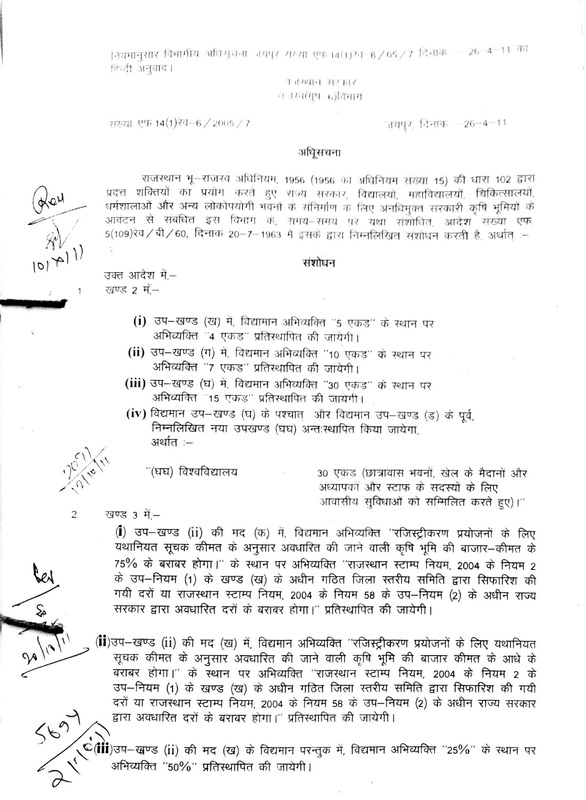 This circular is issued by Rajasthan Government Revenue Gr-6 Department. 4. 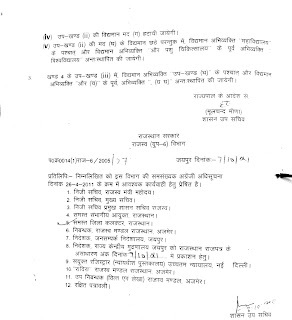 Rajasthan government issue this notification to change limit of land for allotment of school , collage, dharmashala, university, hospitals and other public utility purpose. 5. For download or save this Notification click on Image and Then right click and choose print for print and save image for download. 6. If you want any Notification then please use comment below this post, I try my best to provide it if it is available with me. Please do not ask my mobile number because due to lot of work I am unable to talk with every reader on mobile. 9. Author try his best to provide accurate Notification but no liability is accepted in any typing or other type of mistake in this Notification is only for educational purpose of revenue department employee not for legal use in any jurisdiction. © 2015 Mahesh Chander Kaushik TRA. Simple theme. Theme images by bluestocking. Powered by Blogger.